The Quantek Model 907 is a highly portable oxygen and CO2 analyzer used for the measurement of oxygen and carbon dioxide in gas-flushed ( CAP/ MAP) food packages and process applications. The Model 907 weighs only 2 lbs and comes with a nylon protective case and internal rechargeable battery pack. It can be easily operated without removal from the shoulder strap case. The Model 907 incorporates the latest fast response O2 and CO2 sensors, which allows results to be obtained in 5-7 seconds for rapid spot checks. Our standard sample probe assembly for food package testing connects to the front panel of the Model 907. The sample probe is tipped with a particulate filter and luer fit syringe needle with side-port holes to prevent plugging. Additionally, the probe tip can be fitted with a Moisture Guard moisture filter, which is very useful for testing samples with moisture present. enclosures or processes where a probe must be inserted into the area to be measured. 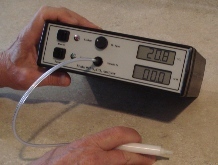 When the internal pump is activated, sample is drawn through the probe and tubing and then to the sensors. controls on the top of the unit for routine operation. Additional calibration and timing control adjusters are on the bottom of the analyzer, easily accessed by removing it from the carry case. The solid-state infrared CO2 sensor utilizes dual wavelength technology for maximum stability. It has no moving parts, no consumables, and is housed in a compact optical cell. The sensor responds to CO2 only. 4-5 years, unlike other analyzers with an electrochemical sensor that last 1-2 years. When required, replacement is easy and inexpensive. The rugged miniature diaphragm pump operates in a timed mode, adjustable by the user, so that it runs only when sampling. It provides a high flow rate and long operating life.